There’s a lyric by the Avett Brothers that goes: “I wonder which brother is better. 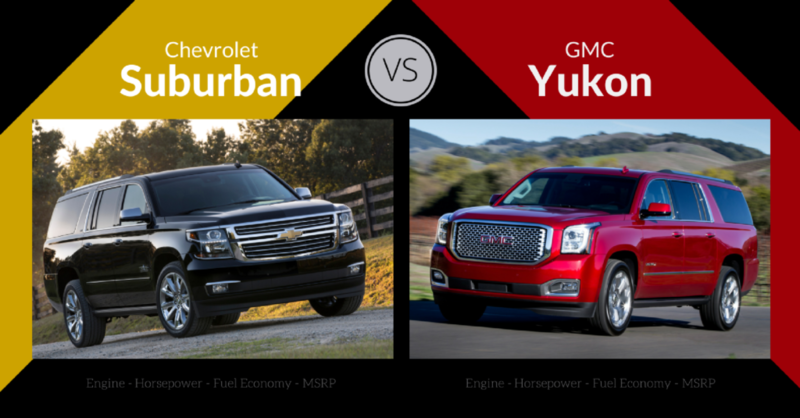 Which one our parents love the most…” that comes to mind when comparing the Chevrolet Suburban and the GMC Yukon. While not siblings in the corporate sense, the two are corporate cousins, sharing the same underpinnings, and about as close as one can get. 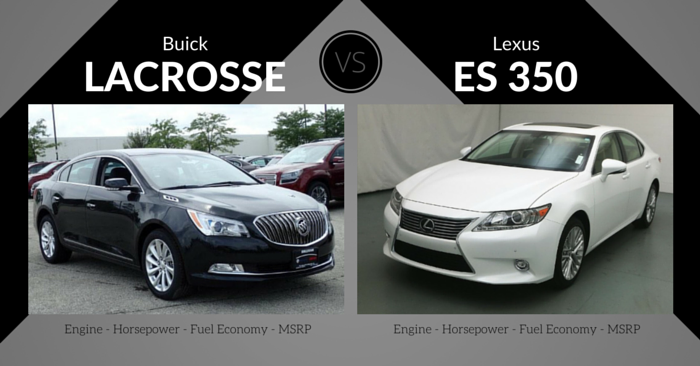 There are some differences, however, but the vehicles mostly have more in common than not. If you examine the General Motors family tree, you’ll notice that the Chevrolet Suburban and the GMC Yukon XL are both the furthest extension of their respective make’s SUV branch, along with the Cadillac Escalade ESV. The next largest SUV in the Chevrolet family tree is the Chevrolet Tahoe, which mirrors the GMC Yukon in size. The difference between the Yukon and the Yukon XL is the wheelbase – the Yukon XL has a wheelbase that is 14 inches longer than the Yukon model and increased cargo space. Beyond that, they fall under the same list of trims and features. 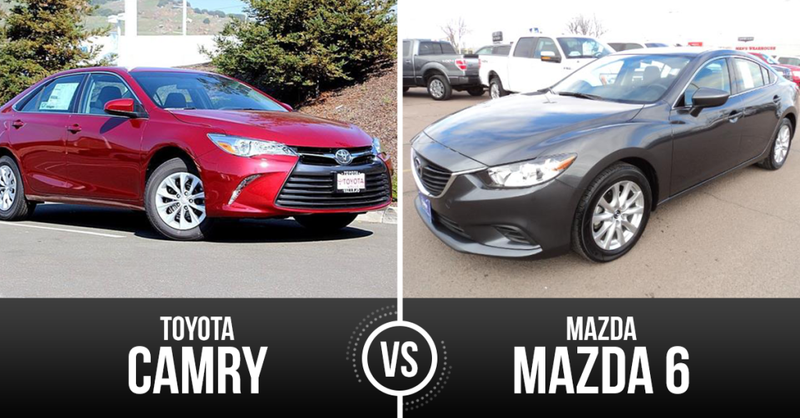 In today’s competitive market and with vehicles tailored better to certain buyers, it doesn’t hurt to examine the differences what these corporate cousins offer to make sure the right buyer is driving home the right SUV. 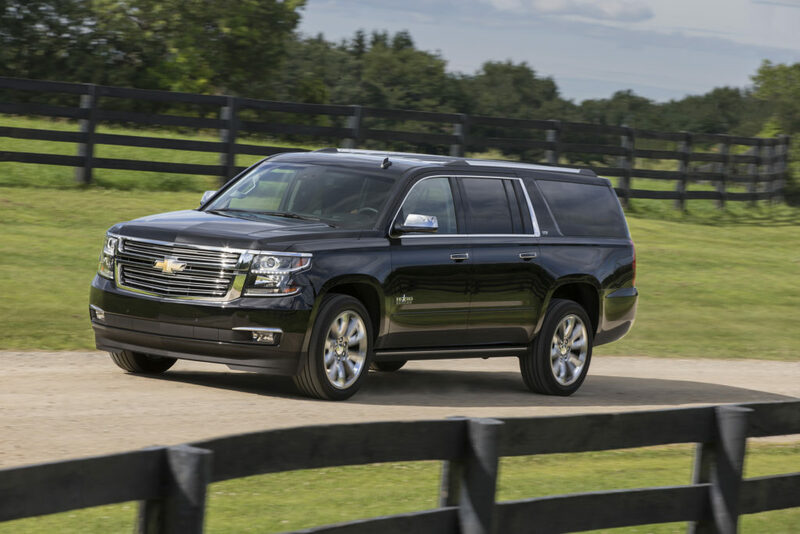 Heading into the third year of the latest redesign and its twelfth generation, the 2017 Suburban continues as a sleek SUV worthy of limousine service. Thanks to the latest generation 2015 redesign, the inlaid doors fit into the body instead of over the top to better the Suburban’s aerodynamics. A lightweight aluminum hood and liftgate panels reduce overall mass as well. The signature chrome dual-port grille and projector beam headlights adorn the grille, giving the Suburban a more refined appearance than previous generations. Step inside and you’ll be taken aback by the spacious, luxurious cabin. Materials are first class. 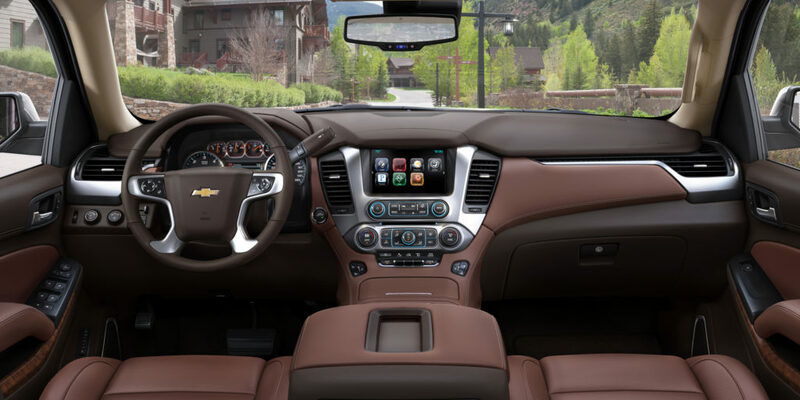 The Suburban is loaded with tech, including available DVD or Blu-ray player and HDMI inputs, Chevy MyLink connectivity, an 8-inch touchscreen infotainment system that integrates Apple CarPlay and Android Auto, up to 14 charge points (USB ports, power outlets, wireless phone charging), and Wi-Fi. An optional 10-speaker Bose audio system is available, as is a heads-up display. 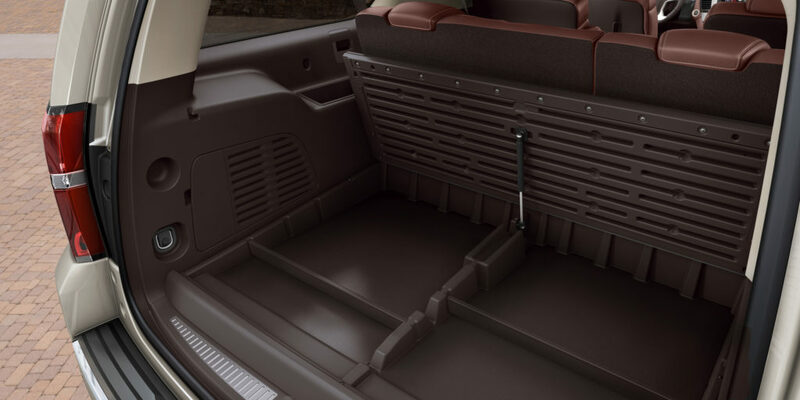 With all rear seats folded down, cargo volume maxes out at 121.7 cubic feet, and at full passenger capacity, 39.3 cubic feet. The Suburban can seat between seven and nine people. A power liftgate is available for easy load and unload, making it a great choice for someone considering a large vehicle that will haul lots of cargo or groceries. Paired with a six-speed automatic transmission, the 5.3L V8 pushes 355 horses and 383 lb-ft torque. Shifting is smooth and timely to optimize power. All trims have AWD available, dropping fuel economy from 16 city / 23 highway to 15 city / 22 highway, but the Suburban makes the most out of what it offers and the engine is tuned to maximize fuel efficiency. In terms of handling, the Suburban handles like the truck-based SUV that it is. For the best ride quality, upgrade to the Magnetic Ride Control suspension of the Premier trim. While not the top in its class for towing capacity, it still manages to tow up to 6,300 lbs., as equipped. In NHTSA crash tests, the 2017 Chevrolet Suburban received a four-star safety rating (out of five). It received four stars for front crash protection, five stars for side-impact protection, and a three-star rollover rating (21.20% rollover resistance). Curious about the ratings? Be sure to check out what the 5-Star safety ratings mean. Teen Driver management system, backseat occupant reminder, rear parking sensors, and a rearview camera come standard with the Suburban. In addition to standard antilock brakes, front-seat side and full-length side curtain airbags, and traction and stability control, optional safety features include forward collision alert with automatic braking, lane departure warning and mitigation, rear cross-traffic alert, and blind-spot monitoring. 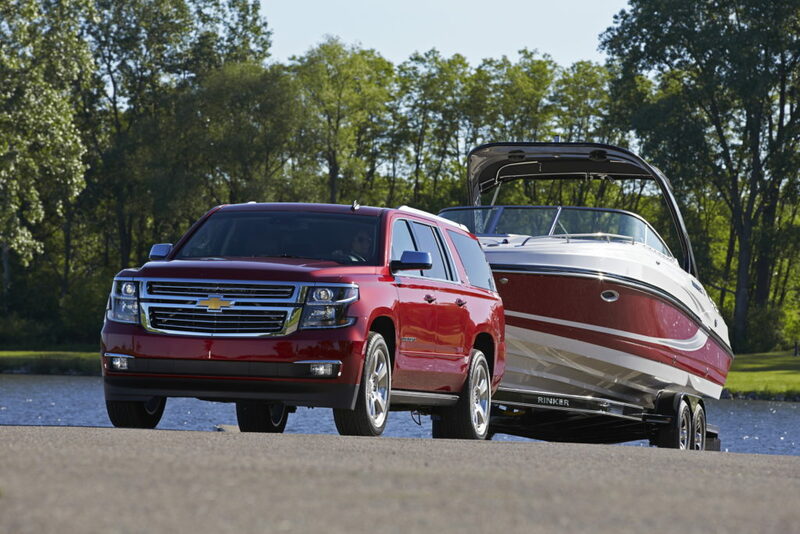 The Suburban is offered in LS, LT, and Premier trims, in either two-wheel or AWD. Chevrolet updated the 2017 model year to include automatic low-speed emergency braking, teen driver system, and backseat occupant reminder. Standard features included at the base LS trim are remote entry and ignition, active grille shutters, rearview camera and rear parking sensors, heated mirrors, automatic wipers, and trailer hitch. In addition to the base features, the LT trim includes leather upholstery, 10-way power front passenger seat, heated front bucket seats, a power liftgate, and nine-speaker Bose audio system. A Z71 Off-Road package is available with the LT trim and includes off-road suspension, underbody skid plates, all-terrain tires, two-speed transfer case, hill descent control, and front parking sensors. A Luxury package offers front parking sensors, blind spot monitoring with rear cross traffic alert, heated second-row seats, power folding rear seats, heated steering wheel, and wireless device charging. Chevrolet offers a Texas Edition which comes with all the features of the Luxury package in addition to exclusive badging and crossbars on the cargo rails. With a new top tier badge that replaces the LTZ, the Premier trim offers the same features as the Luxury package with upgrades to the wheels (20-inch), adds xenon headlights, and a navigation system. Ventilated, 12-way power front seats and a ten speaker Bose sound are also included. Other available features include 22-inch wheels, the Max Trailering package that includs trailer brake control and an auto-leveling suspension for non-magnetic suspension vehicles. You won’t mind being stuck in the middle with the Yukon (between the Tahoe and Escalade) in GM’s family line-up, or the extended Yukon XL between the Suburban and the Cadillac Escalade ESV. The Yukon gets more luxurious looks and offers the same capability as the Suburban, plus a little more. The bold design, introduced in 2015, is stylish and features chrome accents. It is aerodynamic, features C-shaped lighting in front and rear, and laminated windshield and front door glass to enhance quietness. The Yukon shares the same inlaid doors concept that fit inside the body, lightweight aluminum hood, and liftgate panels as the Suburban. A standard rear spoiler on the liftgate adds to the slick appearance, as does a family 18-, 20- and 22-inch wheels, including standard 20-inch wheels on the Denali trim. 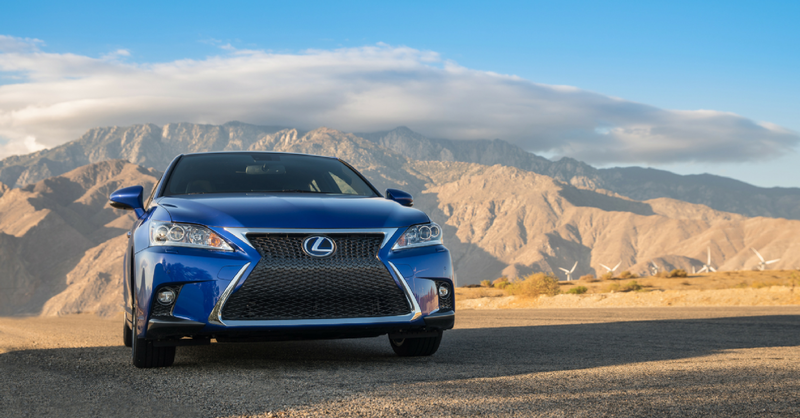 For 2017, Dark Sapphire Blue Metallic is a new available exterior color. Inside, the Yukon features a quiet cabin (thanks to active noise cancellation), quality, soft touch materials, and use of ambient lighting (Blue Ice interior lighting is new for 2017). A Bose sound system comes standard with all trims. Like the Suburban, the Yukon is loaded with tech. An upgraded rear seat entertainment system includes HDMI/MHL connector, an additional USB port, and digital headphones. The interior is powered with multiple USB ports and accessory power outlets, including an 110-volt three-prong outlet. 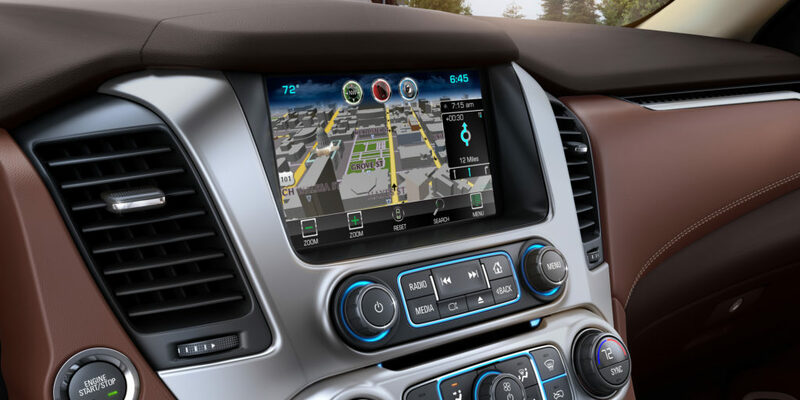 An 8-inch touch screen with enhanced GMC IntelliLink comes standard and integrates Apple CarPlay and Android Auto. Wi-fi connectivity, remote vehicle start, and keyless entry are standard, and wireless charging comes standard on the SLT trim. The same standard 5.3L V8 engine that sits in the Suburban also sits in the Yukon and Yukon XL, pushing 355 horsepower and 383 lb-ft torque. The Yukon Denali and Denali XL comes with a 6.2L V8, pushing 420 horsepower and 460 lb-ft torque. 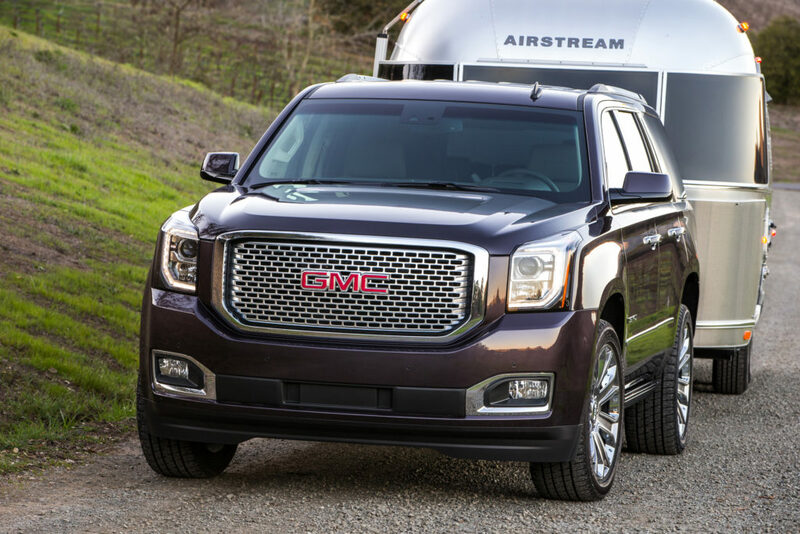 The Denali’s beefier engine has an increased towing capacity from 6,500 lbs to up to 8,400 lbs. The Denali’s standard Magnetic Ride Control System actively adjusts the suspension for more precise control and a smoother ride over uneven terrain. Both the Yukon and Yukon XL come in SLE, SLT, and Denali trims. All come with standard Teen Driver feature to encourage safe driving habits with teenagers and front active aero shutters to enhance aerodynamics on the highway. The SLT model features standard leather-trimmed heated and vented driver and passenger seats. Power third-row seats, power liftgate, and wireless phone charging are also standard, in addition to rear cross traffic alert and blind spot monitoring. The Denali trim, which makes up more than 50 percent of GMC Yukon sales, includes navigation, a 10-speaker Bose audio system, and second-row captain’s chairs. 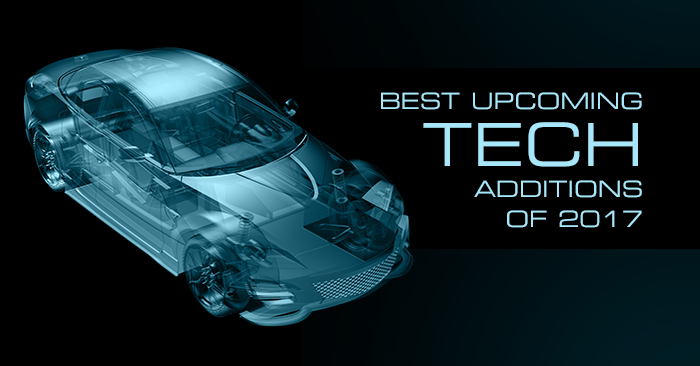 Additional available features include heads-up display, power sunroof, and Low-Speed Forward Automatic Braking. The Chevrolet Suburban and the GMC Yukon XL had combined sales of 97,136 in 2016. That’s not too bad for two full-size SUVs in a small but competitive segment. The Suburban by default is longer in length than the Yukon, with a price tag that starts at $49,915, just slightly above the Yukon’s $48,530 and under the identically sized Yukon XL’s $51,230. 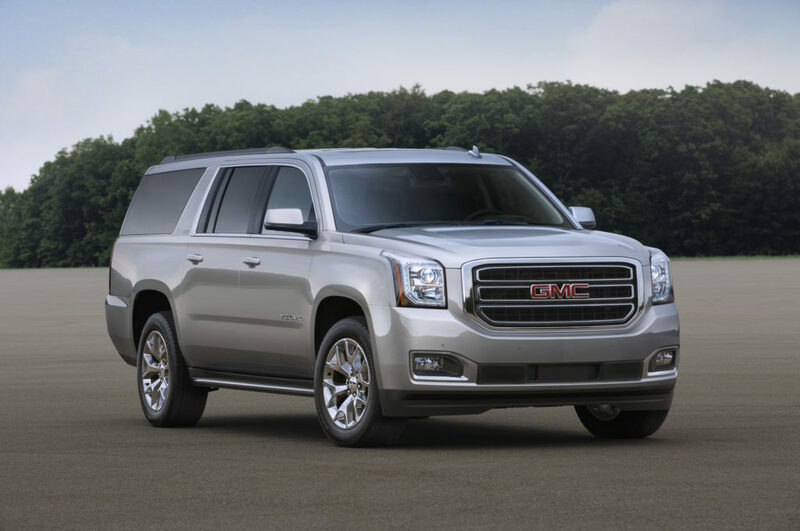 The Yukon offers a wider range of size and luxury, as well as a more powerful engine option than the Suburban. But, that comes with an increase in price. Both are loaded with tech and quality materials. 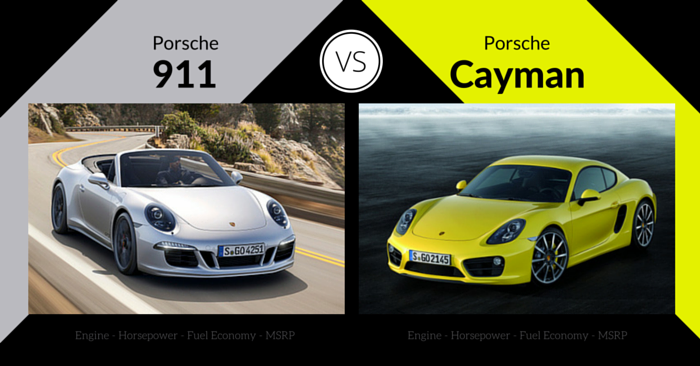 When it comes to safety, they tested the same, sharing underpinnings and very similar design features. What it all boils down to is room, price, and power. If a greater towing capacity and a more upscale cabin are what you are after, the Yukon Denali XL has all the above. 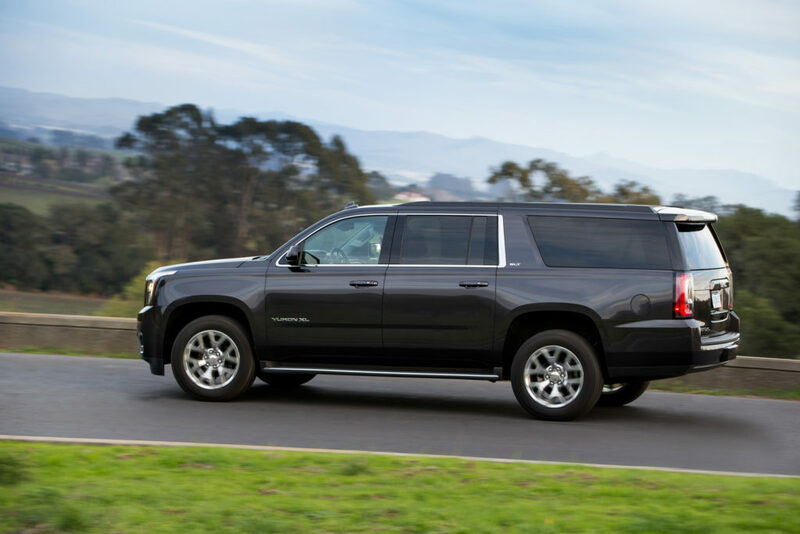 If lesser towing capacity but adequate power and a slightly less luxury cabin will suffice, the Suburban has equal passenger and cargo room as the Yukon XL and almost identical features at a lesser price tag.